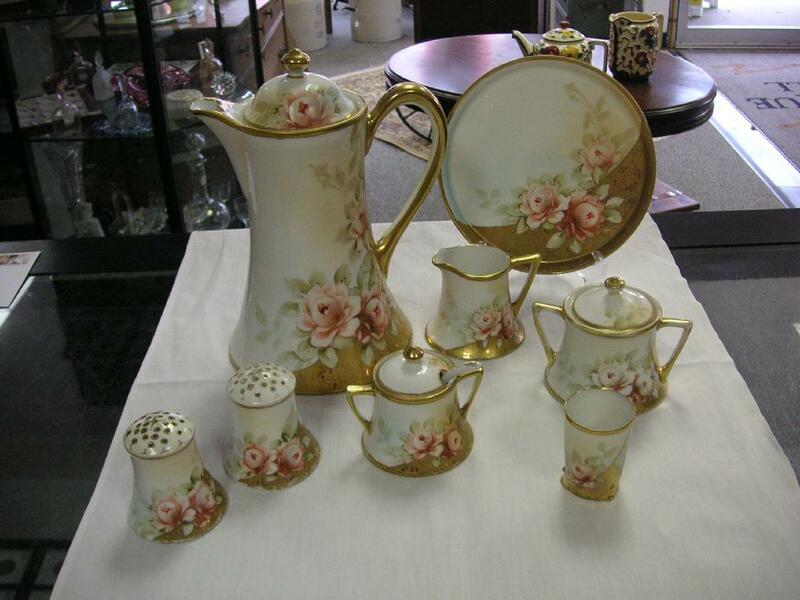 Chocolate Pot, Creamer, Sugar & 5 piece Condiment Set. Nippon pottery was made in Japan between 1891 and 1921. The term Nippon denotes the �era�, not a company. Black Nippon pottery is one fairly rare type of Nippon and little has been written about it. It has an elegance appearance in its simplicity � its starkness. 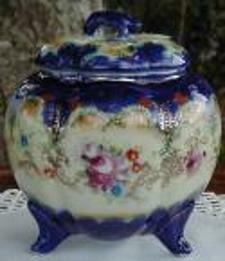 It was being made during the same period as Nippon porcelain, and while many authors, such as Joan Van Patten, have devoted volumes to porcelain, I have discovered no books about �black Nippon�. Ms Van Patten, in one of her earlier Nippon (porcelain) books, pictured one of these black Nippon pieces and commented that that while she did not know much about it, every Nippon collector should have at least one piece in their collection. Thus, the pottery pictured here in the Nippon pottery section is probably over 100 years old and was made to look like Chinese bronzes that would be up to 400 years old. 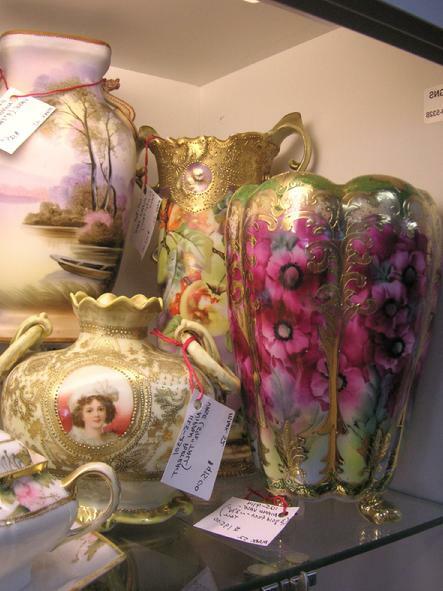 These antique pieces are extremely fragile and easily chipped. The off-white core has been blackened and designed. It is amazing that so many are in such good shape. Most of these Nippon pottery pieces are incised with the word "NIPPON� or �Made in NIPPON� on the bottom. 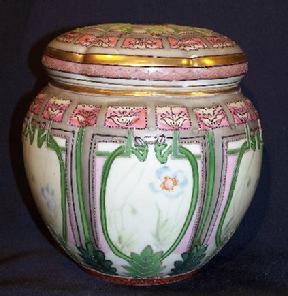 Many are also inscribed with Japanese symbols indicating the maker and/or location of manufacture. 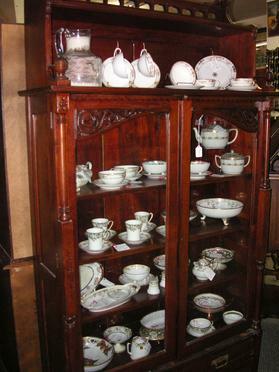 Items marked with Nippon were made especially for export to the Western market and very little of it remained in Japan. The subject of Nippon porcelain is vast, so this guide will focus primarily on identifying 'real' versus 'fake' (modern reproduction) Nippon. 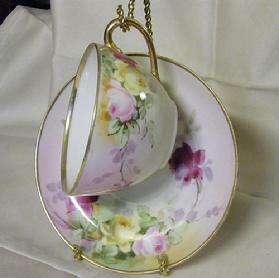 Be aware that some modern / reproduction Nippon is attractive and nicely done (and some is of quite inferior quality); however, you don't want to pay antique porcelain prices for modern Nippon porcelain. 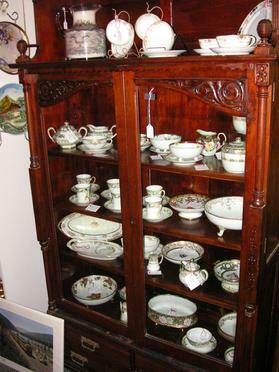 Nippon reproductions from China and Japan are legal, and owing to the popularity of antique Nippon, reproductions have flooded the market in great numbers especially in the last 10-20 years. (Fakes began to enter the country in the late 1970s / early 1980s.) 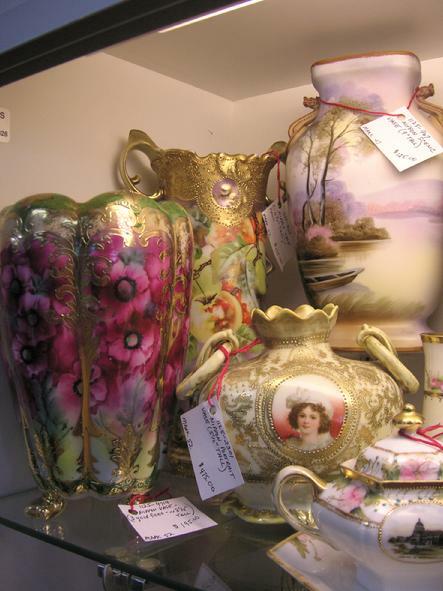 A dealer in antique Nippon porcelain should stand behind what he sells. And when purchasing an expensive piece of antique Nippon, I'd ask for a written guarantee of authenticity. But be reasonable. Someone selling one or two pieces may not realize a particular piece is a fake. And on some pieces it's very difficult to tell. There are about 12 fake backstamps known to exist today, possibly more as of this writing. Examples are: an hour glass in the wreath instead of the letter M (see photo below), the rising sun mark with jagged rays rather than straight lines emanating from the sun, and the maple leaf design where the leaf is twice the size of the original mark, approximately 1/2 inch in length rather than 1/4 inch, and the letter �H� in �Hand painted� is written differently from the original, with a loop. Most troublesome, however, is the M in wreath design, since modern producers in China have copied this mark so exactly it is now impossible to tell if a piece is genuine by virtue of this backstamp alone. The original mark and the fake mark are identical. Since almost 50% of all antique Nippon that entered the USA had the M in wreath mark (circa 1911), you must be VERY careful. 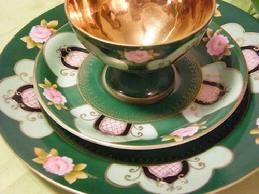 Like the original, the fake mark is under glaze. These pieces originally had a Made in China paper label that could be removed easily and the piece passed off as Nippon. In all likelihood, since the mark is underglaze and obscured by a paper label, the wholesaler had an intent to deceive. Other fakes have no backstamp at all but come into the country with a paper label that can easily be removed and the piece passed off as unmarked Nippon. These fakes are worth only a few dollars each. According to Joan F. Van Patten, the author of "The Collector's Encyclopedia of Nippon, First through Fifth Series, "U.S. Customs has ruled that the fake M-in-wreath mark is counterfeit and not allowed for importation into the United States. 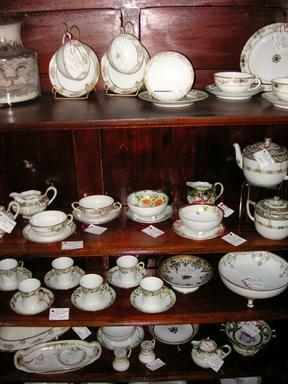 Because of this ruling, wholesalers, for the time being, have stopped marking their fake Nippon with the Noritake Company backstamps (including the Maple Leaf, Rising Sun, and RC marks)." However, be aware that there are pieces with all of these backstamps that entered the USA prior to this ruling. There are probably 50 or more repro patterns of Nippon currently on the market. One found in great abundance is Wildflower, which has a bisque finish on pale green with a wildflower design. There are dozens of various pieces made in this pattern. See the photos below of a round footed box (about 5 inches across) and a rectangular box (about 5 X 7 inches), both with covers. The wildflower pattern is marked with the hourglass in wreath design. 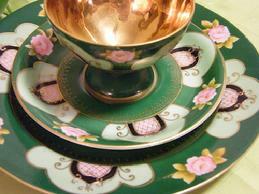 Other fake Nippon patterns include the Orchid pattern (maple leaf mark), the Antique Roses pattern (maple leaf mark), Green Mist pattern (rising sun mark), and the Texas Rose pattern (rising sun mark). A variety of other pieces with no pattern name can also be found. 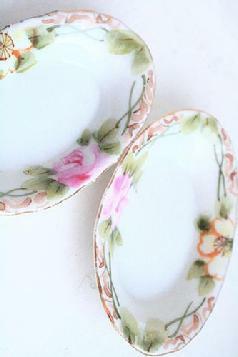 One that comes close to real Nippon is the Antique Rose pattern. 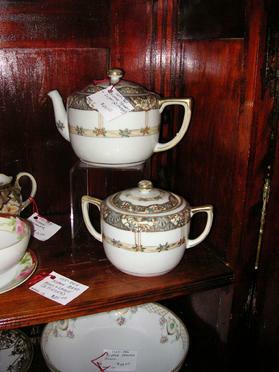 It is easy to be fooled, as the only difference in the mark between the fake and the antique pieces in this pattern is the size of the maple leaf. 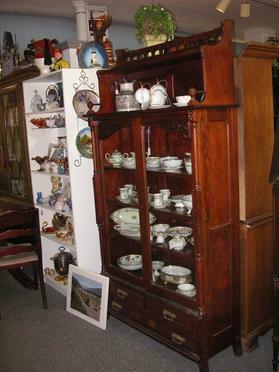 According to Nippon expert Joan F. Van Patten, modern producers are offering items never found in antique Nippon: oil lamps, wine coolers, oyster plates, wall pockets, and more, as well as items that fall under the category of black ethnic collectibles such as a black boy sitting on an alligator and a black 'mammy' toothpick holder. 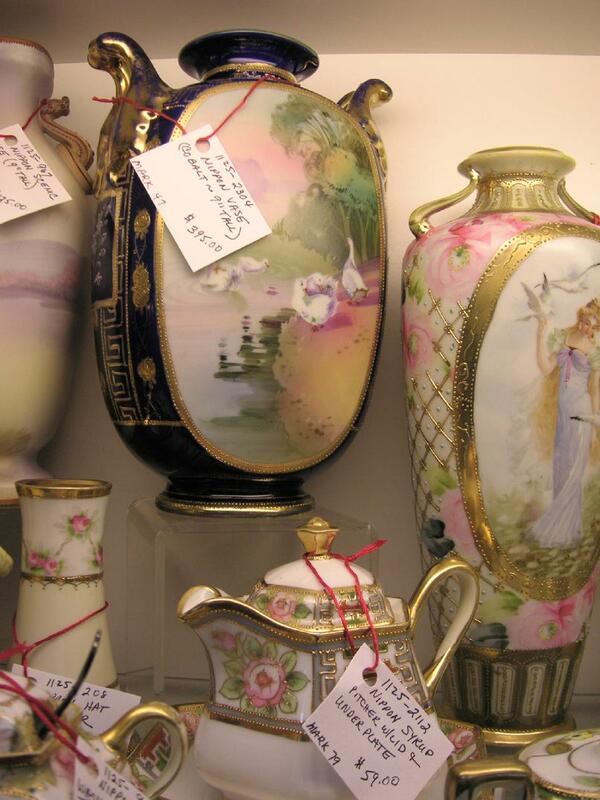 When assessing a piece, examine the painting and the application of details (depending on the type ware), which should be carefully and uniformly done. Look closely at the flowers and leaves on a floral design piece to see if motives are realistically shaded and exhibit quality workmanship: leaves in 2 or more complimentary colors of green, and flowers in 2-3 (sometimes more) colors with brush strokes used directionally to enhance the sense of depth. Examine also the manner of painting of scrolls, curlicues, etc. These, too, should be uniformly and carefully applied, not appearing sloppily done or 'blobbed' on. 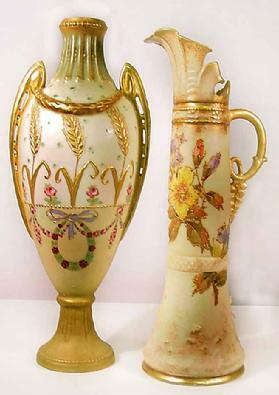 Check for artistic touches such as small complimentary designs added to the outer sides of a piece or painting on vases / urns that wraps entirely around the piece so that it is beautiful viewed from all sides. Applied gold may have a very slightly tarnished look of age but it should still be bright and of high quality application. It should not look like modern luster gold nor should the gold have a burnished, 'muddy' appearance which is often what you will see on fakes. Check for areas of wear from normal handling over a long period of time. Also, note that many reproduction pieces have a bright white (but often rough in places) glossy background not found in antique pieces and feel a bit too heavy for their size, almost 'clunky'. 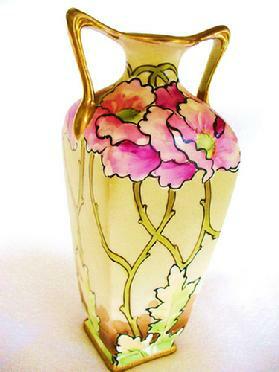 Check the glazing on the inside of the piece as it is often not well done or sometimes not done at all on fakes. Finally, looks at the signs of wear on the bottom. 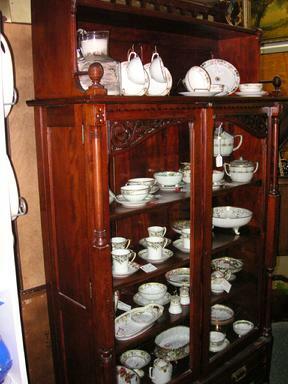 Modern pieces often look brand new and unused or exhibit very poor quality finishing on the bottom; antique Nippon usually will have slight signs of wear normal to pieces 100+ years old but still be nicely finished. Not a fool proof method but another indicator. And never forget, it's all about condition, condition, condition if you want your acquisitions to appreciate in value.